This Petite Waxing Brush has darker hairs. It is the smaller size of the Ultimate Wax Brushes with a head that is about 1.5", compared to the Ultimate Wax Brush where the head is about 2.5" round. SAME texture and feel and performance as the light colored brush, but this one is great for your Dark Wax applications. That way you will never grab the wrong brush accidentally now by using Dark Haired Wax Brush when using your Dark Wax! Personally- this size is ideal for smaller projects or if you only use your dark wax by feathering it lightly in from the corners. Do you need a dark haired brush if you already have another light colored hair brush for your dark wax? Absolutely no. This is just another option and other than the colors of the brush- is exactly the same. If you plan on using both clear and dark wax- it is HIGHLY recommended you get TWO (I like the 1 1/2 inch wax brush that is $28.95 to use with Dark Wax.) 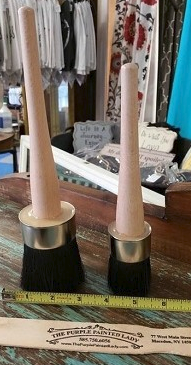 We suggest two brushes otherwise you could contaminate a clear wax piece you are working on if you did not thoroughly remove all of the Dark Wax from your bristles.